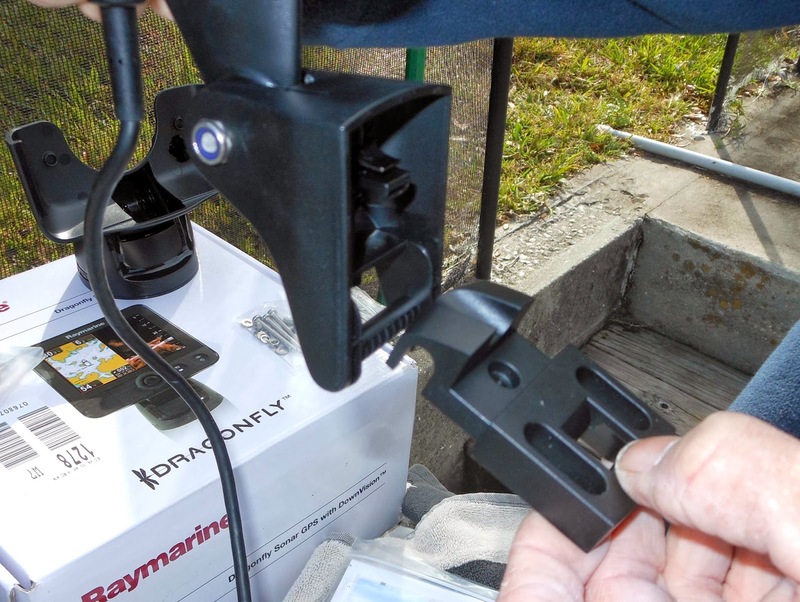 In order to pull the install off, an aging Ray 750 fish finder and its transducer have to be removed first. Its been working in the boat faithfully for 14 years, but now UV has taken a toll on everything including the power cable. The owner, the Honorable Mark Hawkins is familiar with the mysteries of electricity, and when the power cord disintegrated he jury rigged the connections to keep it in indentured servitude. Corrosion of everything made it time to send this unit to a far better place, if the trashcan qualifies as an old marine electronics paradise. The screw gun makes short work of removal, and on the dock it goes. 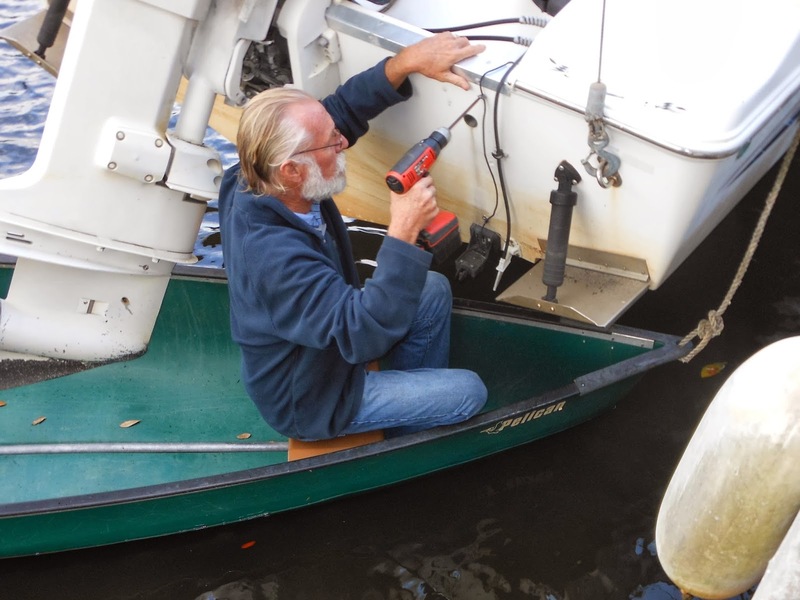 Part two of this is to get the antique transducer off of the boat. We were going to use the old transducer wire to pull the new cable to the console, or that at least that was the theory at the time. It didn't actually work out that way, it's a boat thing. Bobbing in the bow of a canoe lets me less than gracefully remove the transducer. Hold for a moment now for a DIY 101 subset of the install. When the old transducer came off, we had three holes in the boat we have to contend with. There is the hard way, and the easy way to deal with this. The hard way is to grind out the holes, fill them, spray and finish gelcoat, to make the evidence of their presence go away. We aren't doing that. The more direct solution is to use a countersink to allow flat head screws to end up flush with the hull surface. Spare the goo, spoil the hole is what I say. Take the screws, liberally coat them with 5200, and screw them in. Remove the excess with a rag and mineral spirits and you're done. After curing they will be perfectly watertight. We are going to cover the screws with the new transducer mount so you won't be able to see them. The transducer mount has two parts. 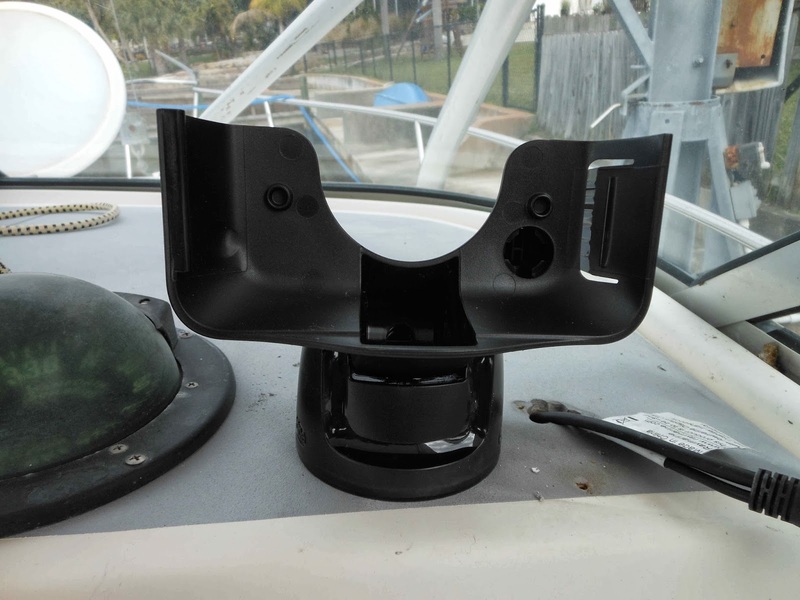 The part that attaches to the hull and the transducer itself. You're supplied with a template, but it really isn't needed. Play with the parts for a minute or two so you understand how they interact. The small part fits inside the transducer mount housing. 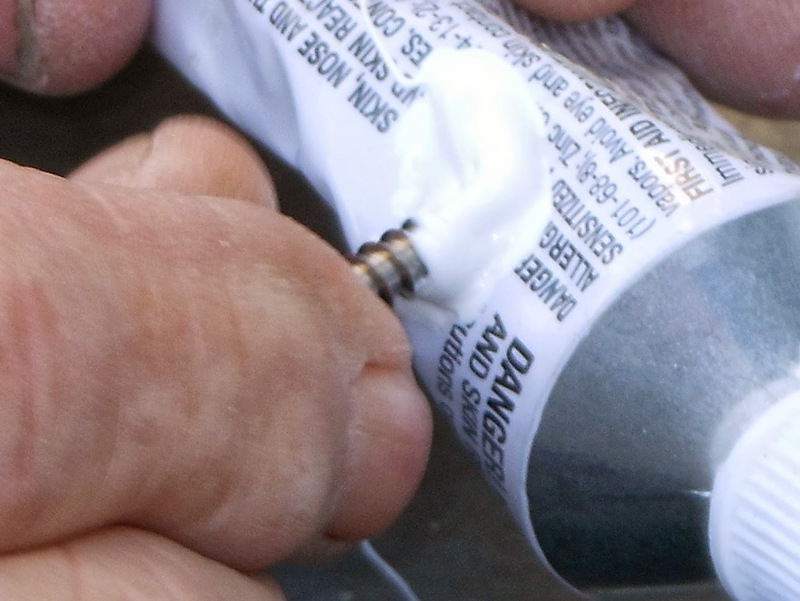 Now stick the two parts together, apply the goo to the screws and attach the transducer. On the top of the mount is a SS hex bolt. This is the anti-kick up adjustment. Find your metric Allen wrench set and locate the 4mm one, (the manual say 3mm, my bolt was 4mm) or just keep trying them one at a time till you get the right one. Crank the screw in a few turns, and try to pop up the transducer. It will most likely will pop up easily, but now you know how it feels. 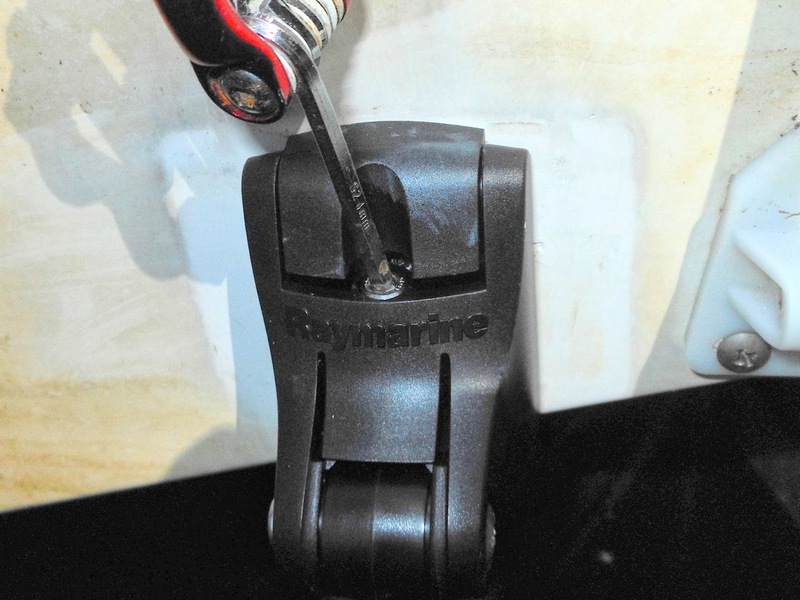 Pop it back down and repeat until you're satisfied it won't kick up at your boat's top speed. You do have to turn the screw more than a couple of turns to accomplish this, but don't force things in a roid rage sort of way, they are just plastic parts. You also have to level the transducer itself. This may require loosening the pivot bolt to do this, and in my case it was stiff enough that I removed the bolt, and manually re-positioned the little ratchet pieces. This wasn't a difficult task. I just didn't want to be the one who broke the critical and expensive part on the new toy. This part of the job is done now. Use the included wire clips to attach the cable to the transom. The Dragonfly comes with three of the little plastic clips. I do wish Ray, and almost every other manufacturer wouldn't be so stingy with these things. Spend a couple of extra cents and throw in a few more of them. Here's why. 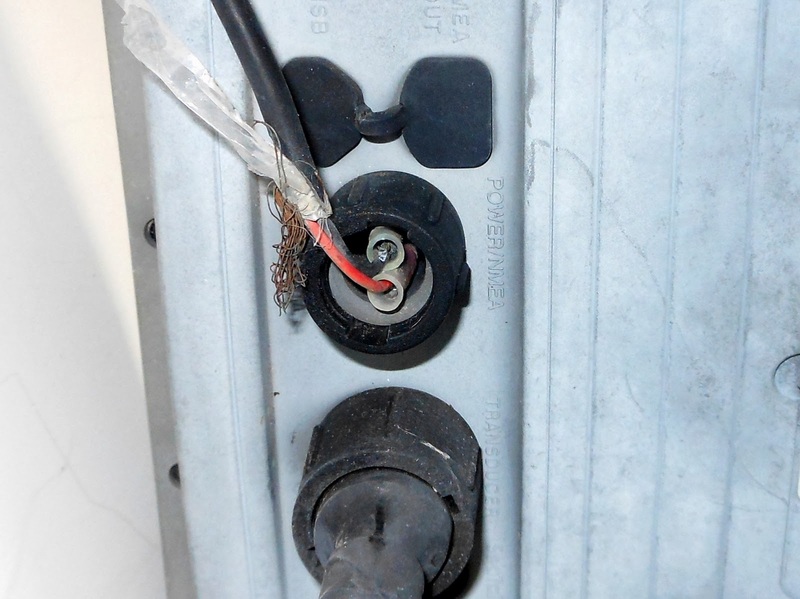 Three is the absolute minimum, and most times you need more to do a good job of securing the cable. There is a Murphy's law that says if black clips are what was supplied, then all I have are the spare white ones in the truck, that don't match and vice versa. Two or three of these clips are not enough 90% of the time. Nuff said. Attaching the mount is straight forward, but with a little touch of nuance. 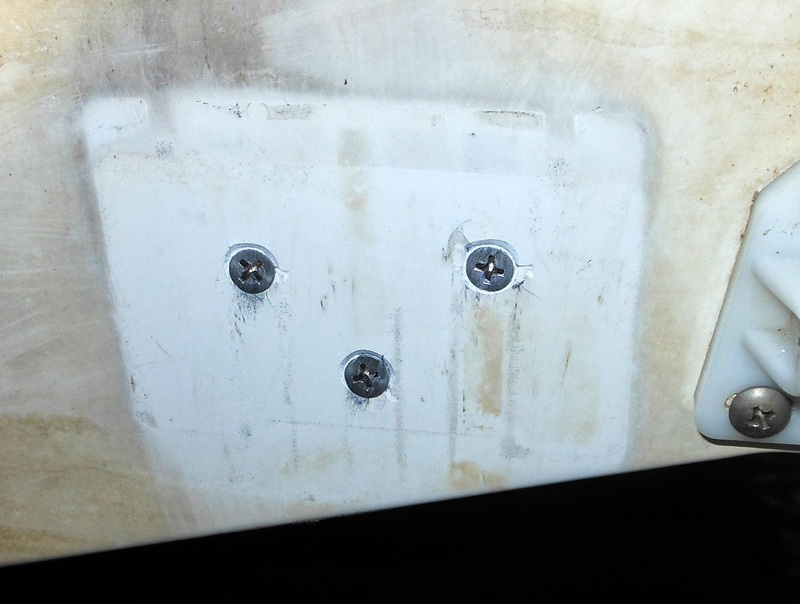 The mounting plate is attached to the console with three screws. There is a nut on the underside. Make sure it hasn't fallen out when you attach it. Before you mount the plate, seat it on the bottom of mount. When you look down on the mount there is a hole in the center for a bolt. You have to tip the mount so the hole is dead center over the bolt. There is only one ratchet stop where this is possible, find it first. Okay now screw the plate down, put the mount in place, find the provided bolt, and screw it in pretty tightly. If it isn't tight the mount will feel wobbly. The Installer's all-seeing eye misses no detail too small. I just thought this was the coolest thing I have seen in some time. 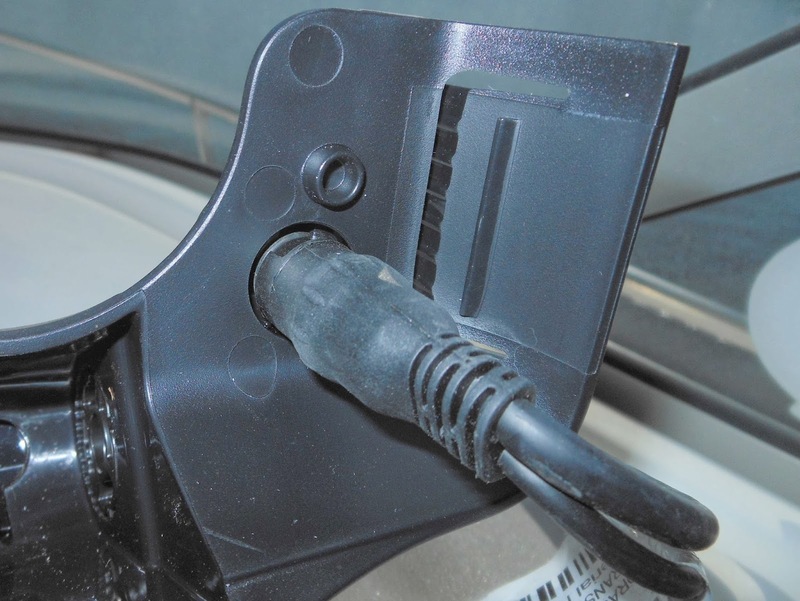 Most connectors come with some type of a weather cap that lasts for a little while, and then breaks, gets lost, or is destroyed by UV exposure. 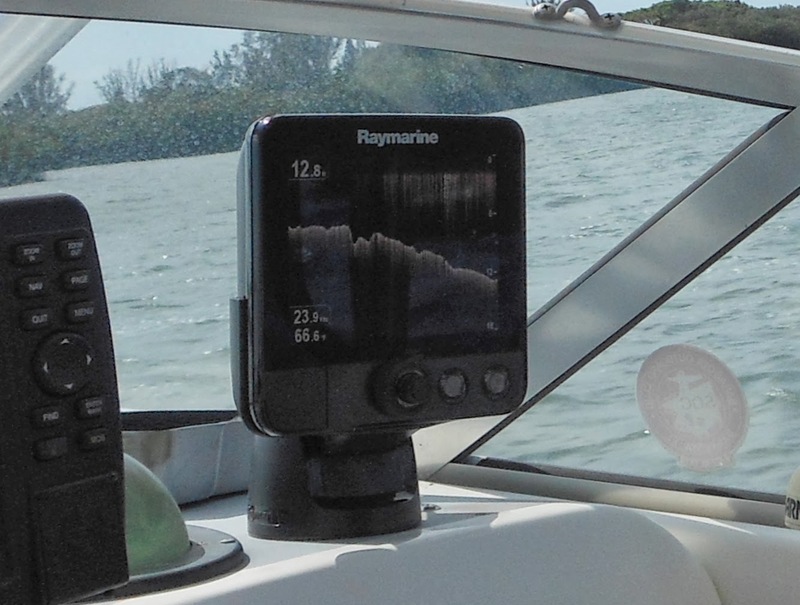 Some very insightful Raymarine engineer designed into the mount a connector parking place when the Dragonfly is not there. He or she should get a bonus, or least an attaboy for being notably clever. It keeps the cable high and dry, and stops dirt and other detritus oft found on boats from getting into the connector. Again, this was a clever idea, and I think most owners may not have noticed it. If you have problems inserting the Dragonfly in the mount, go back and look at the drawing in the instructions you overlooked. You have to pinch the tab on the mount back as well as the face of the Dragonfly together. Still can't do it? Look at the picture again, and try again. I had a short test run on the boat and at 22kts it worked a treat. with very clear imaging. The built in GPS worked well, and the chart plotter functionality was straight forward and easy to use. The unit is designed to be a standalone product, so there is no NMEA interface or networking with other devices. There is also no route capabilities. But for lake and near in coastal fishing, it's more than sufficient. 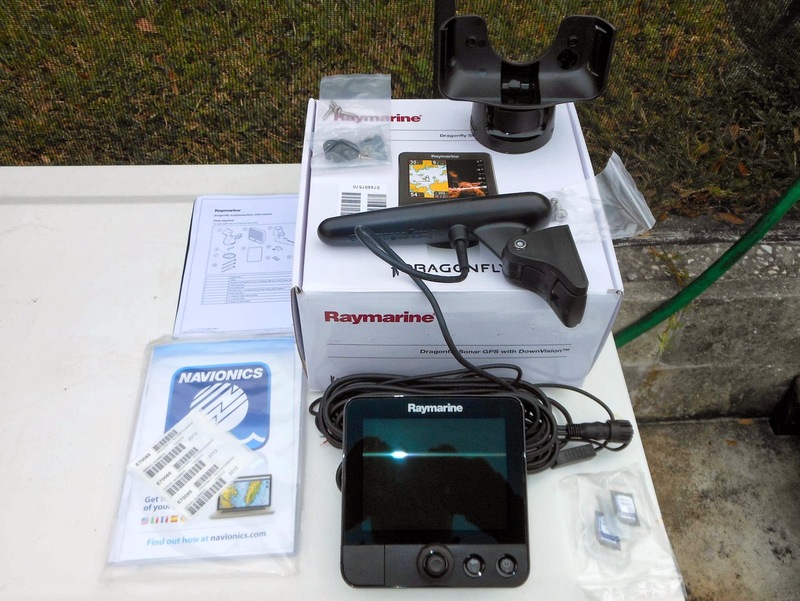 The price online is around $720 with Navionics Gold cartography, and I think it's a great bang for the buck for fishermen. This install was a Saturday morning pro bono group install. So thanks go to Mark Hawkins who was scurrying around opening access areas, and the dash on his boat for me. Dan Sullivan who was passing things to me in the canoe and acting as the photographer of record at other times. It was all in all a pleasurable, and quick install. I'll put up some screen shots next week, and see if any of them are good enough to win Raymarine's monthly Dragonfly screen capture contest. He could get the cost of his Dragonfly purchase back if he wins. 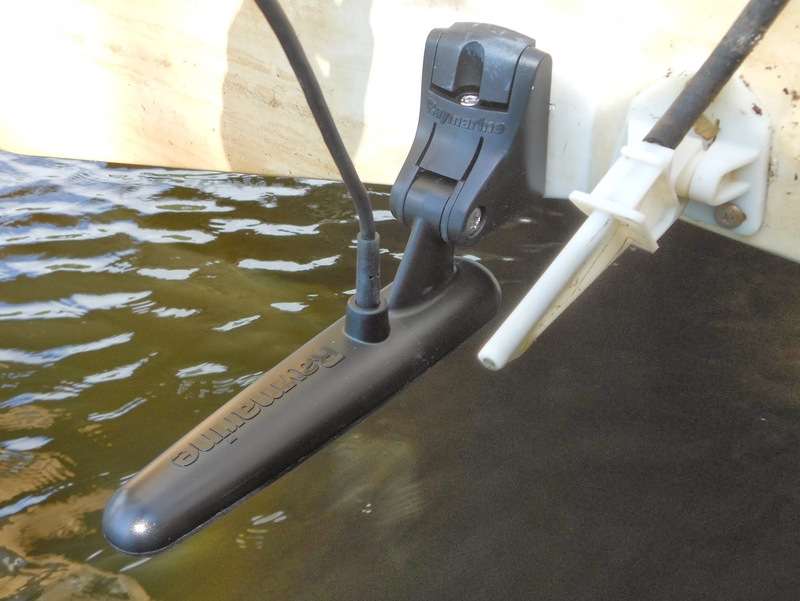 How far below the bottom of the boat is the transducer to be mounted? Directions supplied were not very clear. Had the Dragonfly installed last year. The transom mount broke within a month. Ray stepped up and replaced. After a few trips this year, mount has broken again. Not happy with the design. Like the fish finder. Hey, I have had issues with the mount as well. 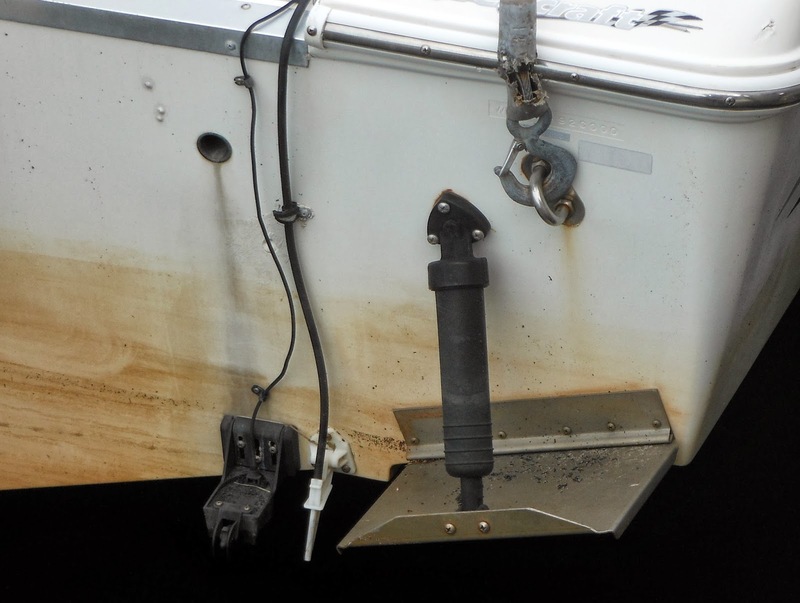 Only 10mm or less should sit below the keel line, or bottom of the boat when moving. Secondly, the kick flap (allen key bolt) should be done up quite tight so that it does not move under high speeds. Went through two brackets... 3rd is going strong.